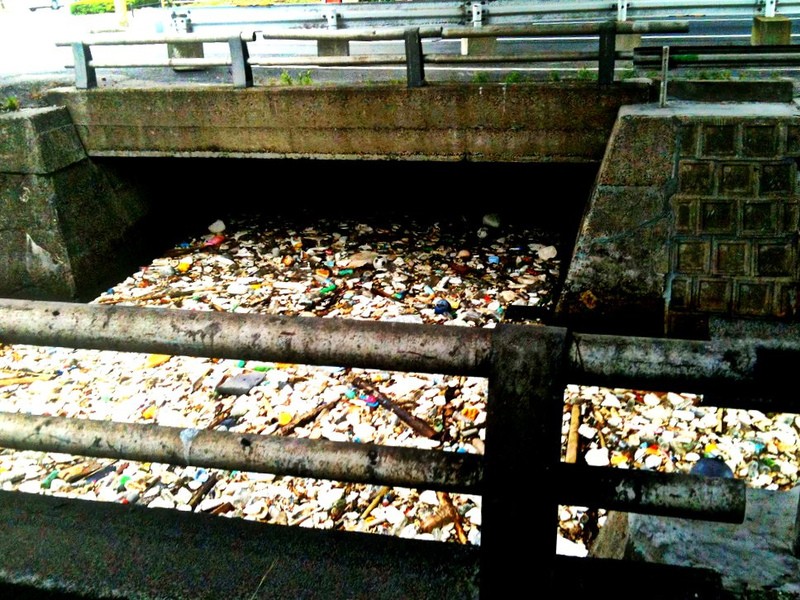 Holy Fire Japan: Only in Japan: Rivers of Garbage? 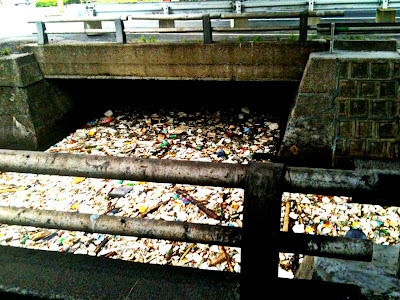 Only in Japan: Rivers of Garbage? Japan is known as the land of many rivers. (Rivers in Japan) In fact rivers played a vital role in Japan`s history and are still used today commercially in a variety of ways. However, recently as I was riding along in my car I saw a startling sight. Japan on one hand is a strong industrial nation which means that pollution of the environment is bound to occur. On the other hand Japan has a strong affinity for nature, as clearly depicted in their language, literature, religion and culture. Shi-zen 自然 or Nature is associated with good and is highly valued even revered by the general Japanese population. It is difficult for many Japanese to see such sights, meanwhile the engine of industry plows through mountains in order to build new shopping areas, and town developments in an attempt to stimulate a stifling economy. Japanese have a love for both nature and industry, much like a man who both loves his wife and his mistress. They love technology and efficient industry for what they do for everyday life and convenience yet pollution tragically is released into the Japanese beloved mountains, (山Yama) forests, 森 Mori) and rivers (川 Kawa). Yet this is not a new development. Tokyo Bay and many other urban areas of Japan are well known for their pollution which are seen as an inevitable side effect of high population. But one must ask, "Is this a necessary process for Japan to compete in the global economy? That as an island, it must sacrifice what little land it has?" I know there are many countries in the world with problems of pollution but it is sad to see a nation of people that worship nature (traditional Japanese religion is Shinto, an animistic religion) unwillingly sacrifice for the sake of "progress." I saw something very similar here in Houston. I was going on a hike near a bayou like i ususally do, and saw a bunch of trash huddled up like something you would see at a beaver dam. In Houston, the bayous carry lots of the run off water and garbage from the streets. It eventually goes into the ocean i think. Because of this very long drought we have been having it isn't unusual for a pile up of garbage. An unintended consequence of a civilized society? I would think, however naively, that holding nature so high in your priorities (to worship it even) would cut down on the pollution a bit. Decisions and regulations to protect the Earth would hopefully be on the forefront of decisions. Obviously, there are no (1) guarantees the regulations will work, (2) methods that give both the monetary effects of industry and fully protect the enviornoment, (3) easily cost effective ways to implement such regulations. Regardless, I always thought Japan's industry environment would be a little better than other industrial nations. I guess that's not the case huh? Good points Ivy. Living in Japan for over six years and seeing the many ironies that exist in Japan, I have learned to accept them as something unique in a way though somewhat tragic. They are a hardy, strong people whom I have both admiration and at times pity. It seems as though westernization and moderation has greatly influenced the attitudes of those in industry. I think most of the general public would be appalled if they knew the truth about pollution and lack of strict regulation.